The history of the western U.S. is a history of booms and busts. A lode is discovered or a policy is enacted (the Homestead Act, the wind energy tax credit). Where once was “pristine” (lightly populated, subtly changed) nature, civilization rushes in, with all its attendant virtues and vices. Then the ore plays out, or the policy changes, or the rain fails to follow the plow. The people move on, leaving the rusting tin cans, the broken dreams, the windmills creaking idly in the wind. And they leave photographs. Stashed away in shoe boxes or on display in county historical societies, these old photos can seem quaintly picturesque. Trapped in their black-and-white world, the subjects seem more actors on a stage than real people who lived, worked, loved and died. 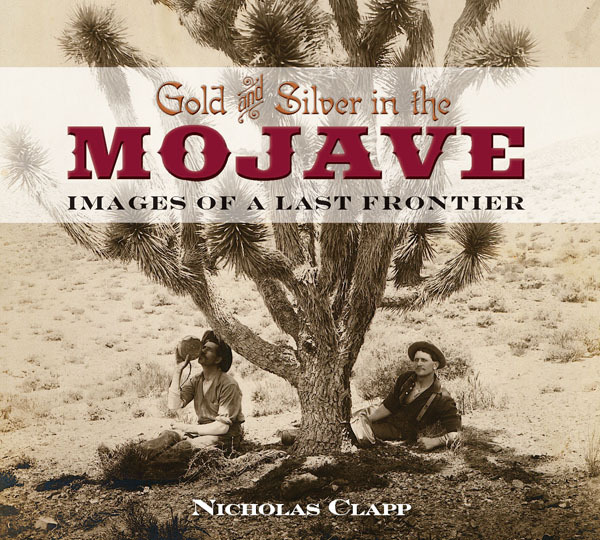 In his excellent Gold and Silver in the Mojave: Images of a Last Frontier, Nicholas Clapp scrapes away that quaint layer to reveal the lives behind the photos. Through vivid story-telling, insightful commentary, and carefully selected photographs, the book gets at the actual experience of the people who were part of this later, lesser-known mining boom, spanning the years 1895 to 1920. Clapp calls it a rowdy Last Act for the Old West. From Randsburg to Ballarat to Tonopah, the book presents photos both expected and unexpected: the gold-panners and the miners, the bankers and the saloon-keepers, the gamblers and the red-light districts; but also the families, the ladies’ clubs, the children, and the Mojave Desert’s first tourists. Some of the most striking are portraits of the people of Tonopah, Nevada, taken by E.W. Smith in his studio, featuring classical backdrops and a laughing gnome for a prop. Himself an award-winning filmmaker, Clapp expertly dissects the images he presents, whether commenting on habits of dress, the expressions of men in a saloon, or the changes in photographic technology that made the images possible. Gold and Silver in the Mojave explores all the ways wealth was made and squandered here. There was the mining of ore, but also the mining of investors’ pocketbooks; “high-grading” (mine workers lining their clothing with stolen ore); the trick of selling out while a shallow claim still “showed;” and “bucking the tiger” – trying to beat the house in the often-rigged game of faro. And of course there is the desert. This being the Mojave, the landscapes are dramatic. Even in their heyday, these boomtowns were dwarfed by the desert that surrounded them, the humans, tiny figures amidst nature on a grand scale. This contrast is even more striking in the book’s examples of “rephotography.” A shot of Rhyolite taken a hundred years ago shows the town of 5,000 that sprang up in less than five years; today, a photo taken from the same vantage shows the blackbrush holding sway once more. Residents of currently booming North Dakota, take heed: this is your future.